Those who love costumes and textiles will like this site. But those who love embroidering will LOVE this one.It deserves instant bookmarking in favorites. The site is Costumes and Textiles at Henry Art . This link will take you to the introduction page and from there you can click on various links and explore the various aspects of costumes and textiles. For instance,clicking on Textiles and then Textile Structures will take you to a page which lists different types of fabric.Click on each and you can read about each type. 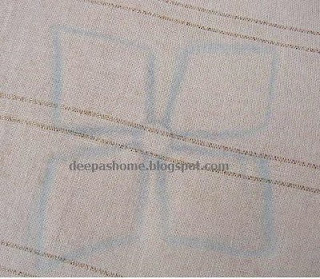 Here is a beetlewing embellished cloth from West Bengal,India. Its a beauty. And the best part,here's the instruction for Phanda Knot in Chikan work. If you look around you'll find more. So, what are you waiting for? Go on ,have a look and bookmark it in your favorites. Thanks you Deepa for sharing this wonderful information.This will be very useful to all of us. Thank you for finding this Deepa! I hope it's okay that I put a link to your post on my blog. Oh my! That's fantastic. I can't believe the Henry is in Seattle (about three hours from here) and I've never been. Next trip for sure!